Music has always been a huge passion of mine. Before I had my children, I used to go to a gig or festival at least once a month, usually more. I had new albums being delivered all the time and loved discovering new bands. Of course, life has changed and I can't even remember the last time I went to see a band perform live. But I still love to listen to music so I can't tell you how excited I was to receive an Electric Jukebox device to review! So what is Electric Jukebox, I'm sure you're wondering? It is the UK's only music streaming service and device. It's a nifty little gadget that plugs into your TV via the HDMI socket and connects to your WIFI to turn your TV into an awesome music machine. It has some 29 million songs, covering all sorts of genres, artists and ages as well as playlists put together by celebrities such as Robbie Williams, Stephen Fry, Alesh Dixon and Sheryl Crow, and it's so simple to use that even my four year old can do it. 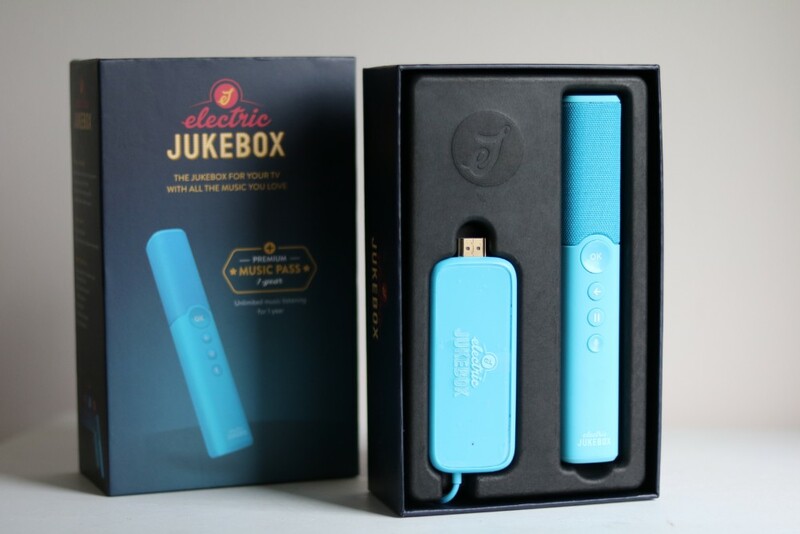 Electric Jukebox, which comes in red, blue and charcoal, comes in two parts. 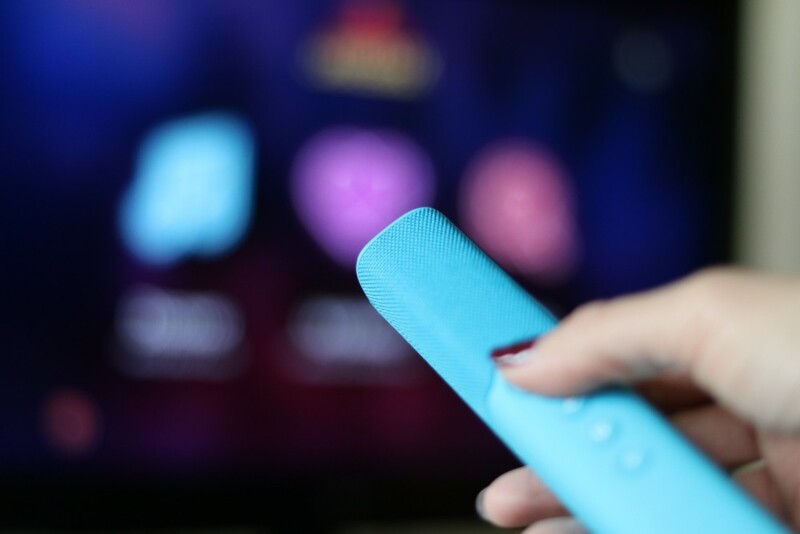 There is the device which connects to your television and WIFI, and a wireless controller which has a "point and click" motion sensitive function or you can use the voice search function. It took us literally minutes to set up; I simply plugged the device into my TV, entered my WIFI password after the device had automatically scanned for available connections, and then we were ready to choose some music. The device remembers the WIFI connection so after the first time we have been able to go straight to the music. Electric Jukebox costs £169 to buy, but get this, there is no monthly subscription to pay, and there are absolutely no ads! The device comes with one year's premium music pass which starts the first time you connect it. After that first year it reverts to the basic service or you can can continue the premium service for £52 per year. That works out at just £1 a week, so much cheaper than monthly subscriptions! If you stick with the basic service you still have access to all the songs, albums and celebrity mixtapes, just with ads. When you think that some music subscription services cost £9.99 a month, or add up the cost of CDs, it's actually incredibly good value for money! This week we have absolutely been loving listening to the Christmas themed playlists - there's a classic one, a more modern one and even a cheesy one! We have had to listen to Justin Beiber on repeat a few times as he is Little N's favourite ever (he is only four!) but we've also been checking out the current charts as well as some of the other playlists; there are loads that will be perfect for New Year's Eve! Electric Jukebox has totally changed the way we listen to music, I've now got access to anything I want to listen to at the press of a button. I just have to wrestle Little N for the controller! Do you love music? What's your favourite album? Thanks to Electric Jukebox for sending us the device to review. Bump in the night... A pregnancy confessional! Happy Days: Wow, wow, wow! Santa's Grotto at Paradise Wildlife Park!